"Premiera" - tour operator was founded in 2010 and it is one of the largest tour operators in Russia right now. It is in the Federal Register of Tour Operators as domestic, international inbound and international outbound tour operator, the registration numbers are: RT 018157, RT 017785, RT 019284. The company's development began from St. Petersburg. The specialists of the operator's structure are professionals in their field and have a successful long-term experience in the tourism industry. 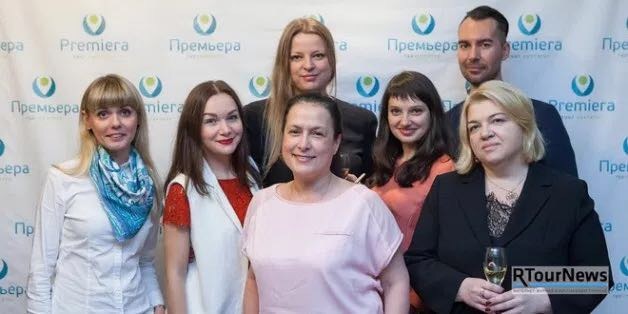 For seven years of productive work, Premiera has gained a foothold and established reputation and opened offices in five Russian cities: St. Petersburg, Moscow, Kazan, Ekaterinburg and the Caucasus Mineral Waters. In 2015, the activities of the tour operator expanded. The company has its own vehicle fleet. Expansion of the staff and offices allowed to increase the list of ongoing events in order to promote the brand in Russia and abroad: events, seminars and conferences, advertising campaigns based on the B2C and B2B segment, marketing research. 3. 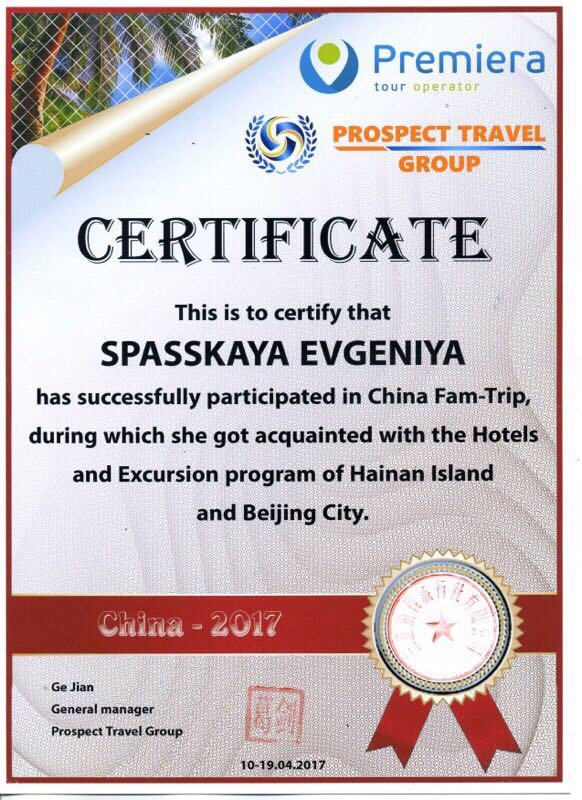 October 2016 - Joint project with the Committee of the Republic of Tattarstan - co-organizer of promotional tours to Kazan for representatives of travel agencies. 7. March 2017 - organizers of the Russian road show "Travel the Silk Road and visit Astana EXPO 2017"
15. November 2017 - participant of the exhibition "WTM World Travel Market London 2017" and co-organizer of the project "Palaces and Mosques", the presentation of which will be held November 6 in London at the exhibition "WTM World Travel Market London 2017". Unlimited love for Russia and the desire to promote domestic tourism, opens new horizons for the company and from 01.09.2015 "Premiera" actively starts receiving tourists across Russia. By now, the operator is actively implementing excursion tours, developing such areas as: Karelia, Golden Ring, Kazan, Kaliningrad, Silver Necklace, Caucasian Mineral Waters. The development of new directions is carried out by a professional team managed by a top manager, with experience and knowledge of international and domestic tourism, which allows using international standards for the development of tours around Russia. 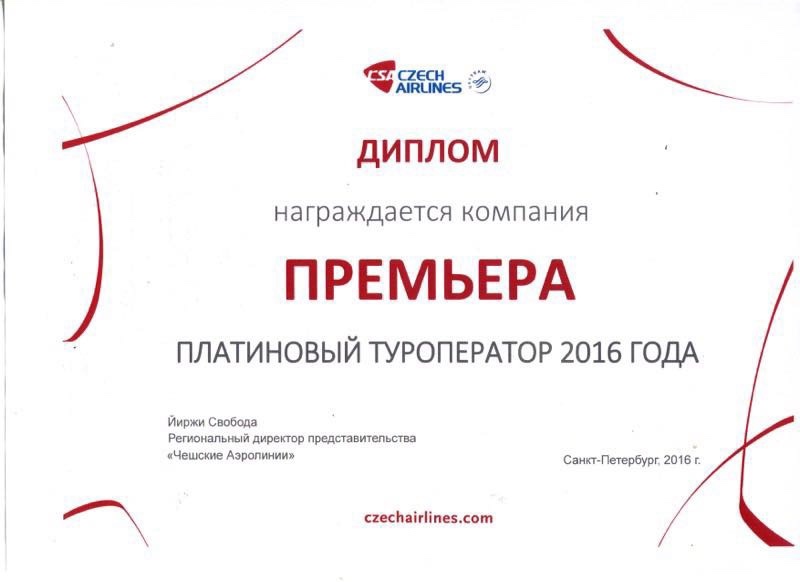 The tour operator «Premiera” continues to occupy a leading position in the Czech Republic, Hungary, the Baltic States, France, Andorra, Italy, Spain, the Benelux countries, Montenegro, Tunisia, India, the UAE, China, Portugal, Greece, Austria, Cyprus, South Korea, Indonesia, Cambodia, Mexico, the Dominican Republic, the Caribbean, Thailand, the Seychelles, the Maldives, the Philippines, and other exotic countries. We have the most reliable partners in air and railway transportation, which carry out direct and connecting flights from 30 cities of Russia and the CIS. We have accreditation in all the Schengen contries consulates. The quality of the proposed product guarantees a high demand for the services provided. "We are for loyalty, friendship and long-term work with our agencies. For us is very important your trust and we, in turn, will justify it "